During a university course of the master programme Business Information Management a couple of years ago, me and my teammates had to come up with an idea for an app. What started as a uni assignment turned into a great startup adventure. The pitch: do you hate waiting all alone for your friends to arrive at a bar? Or are you always the one running late? Then try Whever! The app that tells you when your friends will arrive, and incentives you to arrive on time, by introducing a fun penalty or reward. 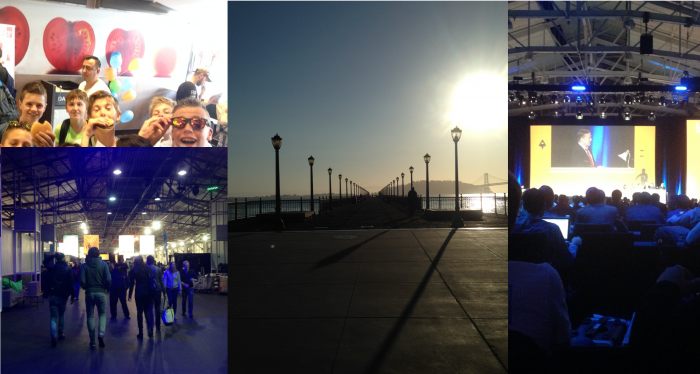 Eleven months down the road, however, that journey had come to an end, and it was not because we got acquired. So what went wrong and what have I learned from this experience? To start with a problem sounds intuitive but it’s mindblowing how many people don’t get this and start with ‘a great solution’. Although we started with a problem, we naively assumed that because we had the problem, of course everyone had the problem. I interviewed 20 target users but asked all the wrong questions, such as ‘Would you use this app?’ and ‘Would you like to be updated when we launch in the App Store?’. Also, I was only hearing what I wanted to hear, namely compliments “This is such a cool idea!” and false promises “Ofcourse, I will download the app once it’s out!”. I then reported back to my co-founders extremely excited telling them about my (false) positive findings. After reading Patrick Fitzgerald’s The Mom Test I knew better: it’s all about asking for situations in the past rather than hypothetical events when we can conclude that 1. there is a problem, and 2. that the problem is worth solving. Once the app was launched in the App Store (ten months after starting Whever – two months later we would have quit Whever), I went to Rotterdam Central Station and randomly approached people asking whether they had ever arrived late to an appointment. Within one afternoon, I realized that there was no need for our app: when people arrive late to a meeting, they either call or Whatsapp their friends. Problem solved, Failure List Checkbox 1 ‘No market need’ checked. We didn’t have a clue on how to make money, and it didn’t seem to bother us at all. Once we were getting to the point of running out of cash, we started testing business models with various target groups one by one. None of them worked out. We started worrying too late. If you can’t find anyone who will pay for your product, ask yourself whether you are really adding value in the first place. Positive cash flow has two main benefits: it validates your business’ reason for being, and – at least equally important – it pays the bills so you don’t have to rely on other people to pay for your cost of living. Therefore, if you have created your minimum viable product, try to let target users pay for it as soon as you can. If your product really solves a great frustration, customers should be desperate to give you their money. Beside the fact that we had zero product market fit and had run out of money, we didn’t make a good team. I realized that a smooth university working relationship doesn’t mean that running a startup together will go as smoothly. It’s OK if you don’t fit together, that happens. 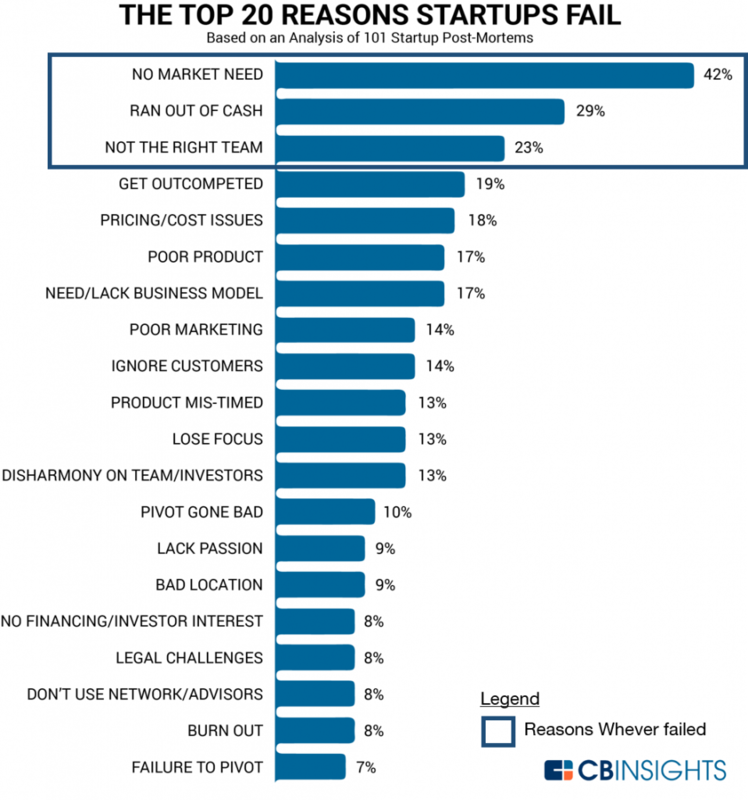 As highlighted by CB Insights, it’s the third biggest reason why startups fail. Therefore, it’s important to see whether you and your potential cofounder make a good fit before you decide to run a company together. Spend some time together and have a good conversation on why you’re in it, what you want to get out of it and how you thrive in a team. Understanding each other’s reasons to start a company will help you understand whether it’s wise to form a team. Furthermore, it’s vital to have complementary team members with whom you can create the core product without needing external help. Even though the three of us each had our own expertise (one of my co-founders dealt with tech, my other co-founder did legal and accounting, and I was in charge of users), none of us could code. Given that the core of our product was technical, we ended up spending a large chunk of seed money on app development. Not being able to create the core product ourselves was a major dependency and I would not go down this same route the next time I intend to launch a technical product. Taking on external money is a big deal, and I would try to stay away from it for as long as I can the next time I launch a product. The earlier you decide to look for funding, the more freedom you will give up. Therefore, it’s wise to ask yourself whether you want to be venture-backed in the first place. Think twice about this tip even though the thrill of all that $$$ will greatly impact your ability to think clearly and wisely about anything else. Next, if you decide to take an investor on board, do some due diligence. Check the person’s background, ask for references and have a serious conversation on how everyone likes to work in a team. Last, once you and the investor have concluded that you foresee a bright future together, make sure you talk about the terms of the money and take some time to go through all of the legal implications and consult some lawyers before popping the bottle. We had an incredible amount of assumptions on various topics that we didn’t test. Some of our hypotheses: “everyone has our problem”, “people need our app to solve the fact that they are running late”, “businesses (dentists, food delivery companies, large accounting companies and lawyers) definitely need this app”, “people are definitely going to adjust their behavior once they use our app”, “there is no way to simulate our app without having developed something” and the list goes on. By the time we actually started to test these hunches the right way, it was too late. Therefore, I recommend testing your beliefs as soon as they come up. Get out of the building, get on the phone, do whatever is necessary to validate your thoughts. If me and my co-founders had tested these assumptions on day 1, we could have concluded within days that really, there was no market need for Whever. For the first four months during our adventure, we were advised by various people to create a minimum viable product. We went around saying that our problem could only be tested with a real product, and that we were working on a ‘real MVP’. In hindsight, I laugh thinking back of this. There are always simple and low cost ways to test your product without having to work for months on a technical draft. For example, a couple of months ago I had the brilliant idea of becoming an eBay reseller for busy people who want to get rid of their valuable items. I could have spent time on creating a website, setting up ads, and waiting for people to contact me. Instead, I asked friends and family whether they had stuff to sell, picked the items up and put everything online. I soon discovered that being an eBay reseller was not commercially viable and decided to call it a day. No tech required to make this decision! All it takes to test your solution is some creativity. It’s clear to see that startup life will bring much higher highs, and much lower lows, than being employed by someone else. Although startup life with Whever was mainly a chain of slaps in the face, the highs made up for a lot of the lows. And even though in hindsight I realized that I’ve been frustrated probably 75% of the time, I wouldn’t have wanted to miss it for anything and I have no regrets to have launched with my co-founders Whever at all. Being employed, on the other hand, gives you a much steadier emotional state. You’ll have a guaranteed paycheck at the end of the month, you’ll work mostly from 9 to 5, you just do your thing and that’s it. There are no extreme lows (except when you get a burnout), and no extreme highs. Also, I’ve realized that paychecks tend to make me lazy. Prior to receiving seed money, me and my co-founders were hustling at our side jobs and working 6 days a week altogether. Once we got our first check, our hustle pretty much stopped, and our lives started to look a lot like that of a normal employed person, except that we still had various extreme lows. 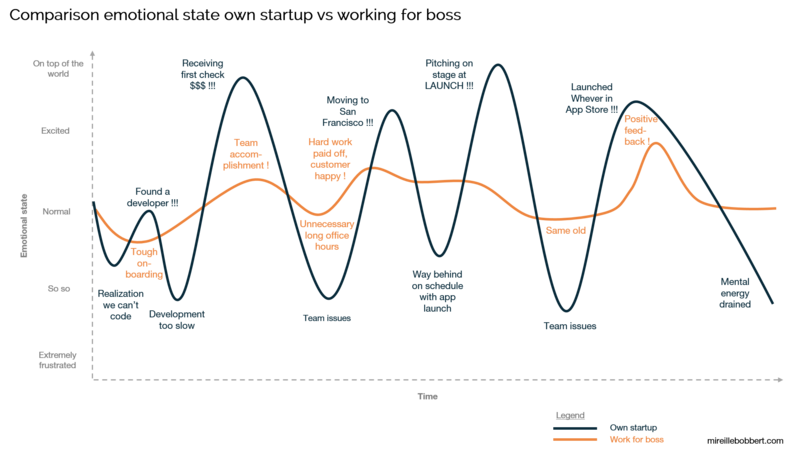 Understanding which of these two emotional states you are more comfortable with will help you decide whether startup life is for you. No matter how successful you are (or not), it’s important to stay humble. As we met our investor during university, we were convinced we were on to something big early on in our adventure. Consequently, when we decided to enroll in an incubator programme, we were skipping homework and only half attended weekly classes. There was a book that was recommended for the course called “The Startup Owner’s Manual” by Steve Blank. It’s a great book, I discovered in hindsight. We ofcourse didn’t use it, because we didn’t need it. We were way ahead of all those tips mentioned in the book, and lessons provided during weekly meetups of the programme. Turned out we could have really used that book, along with those tips from startup class. It’s embarassing to think back of how I must have come across on some occasions. This insight taught me to stay humble throughout my journey. If you have reason to believe you’ve made it, think again, because chances are high you’re just getting started. Note: These are my personal lessons on Whever. I haven’t consulted my ex co-founders for this article. Truly quite a lot of good data! Appreciate it. Quite a lot of posts!